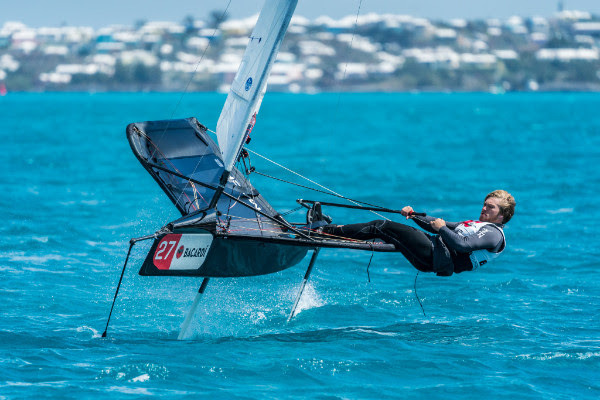 Racing for the Bacardi Moth Bermuda National Championship got underway on Friday [March 23] with overseas visitors stealing the limelight. British sailor Paul Goodison won all three races contested, each by a large margin. He holds a 7-point lead over fellow British sailor Ben Paton, who is 4 points ahead of Australian Matthew Chew in third place. Sailing in a building southwesterly breeze that started at 10 knots and gusted up to 30 knots as a squall came through at the conclusion of Race 3, everyone enjoyed the day on the water. The Bacardi Moth World Championship officially begins on Monday. Racing this weekend is for the Bacardi Bermuda Moth National Championship and includes 34 of the 46 sailors entered in the Worlds. The Bermuda Moth Class Association President James Doughty is mixing it up with rivals Nathan Bailey, Josh Greenslade and Benn Smith who, at 18 years old, is the youngest entrant in the fleet. Greenslade has 73 points, Doughty 74 points, Smith 85 points and Bailey, who sailed just the third race, 90 points. “We’re having great racing amongst each other within the larger fleet. We’re constantly swapping places whether we’re sailing upwind or downwind,” said Doughty, who finished either just ahead or just behind Greenslade. 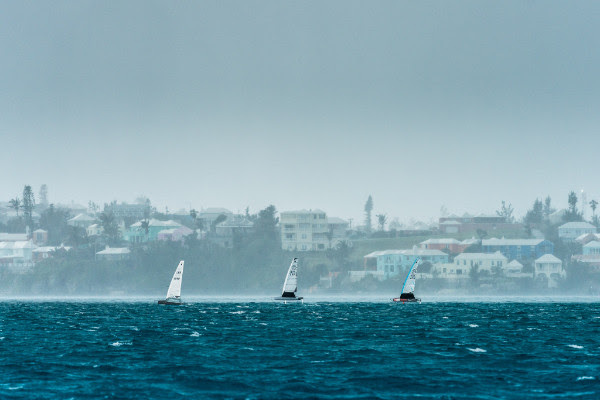 Although the Bermuda Nationals is an open regatta, the title of Bermuda National Champion will go to one of the Bermudians.